Equality--much like life, liberty, and the pursuit of all that jazz--just seems like one of those fabulously fundamental human rights that we all ought to be entitled to. But if 5th grade American History taught us anything, it's that (sadly) this just ain't the case. And, though here we are, smack dab at the rear end of 2015, it still seems to be something all too many are fighting for. Equality Utah is one of our stately champions working for the equal rights of LGBTQ folks and their families statewide, and we can hardly think of a more worthy cause to champion. While many-a stride have been made to that end in 2015 (nationwide marriage equality, anyone? ), there is still much work to be done, and the fight is far from over. To help Equality Utah continue their efforts, the organization is holding their annual Allies Dinner fundraiser. According to the group, the evening will be an "inspirational and entertaining evening to celebrate our victories this year, look to the work still ahead, and uplift our community values of love and opportunity for all Utahns". 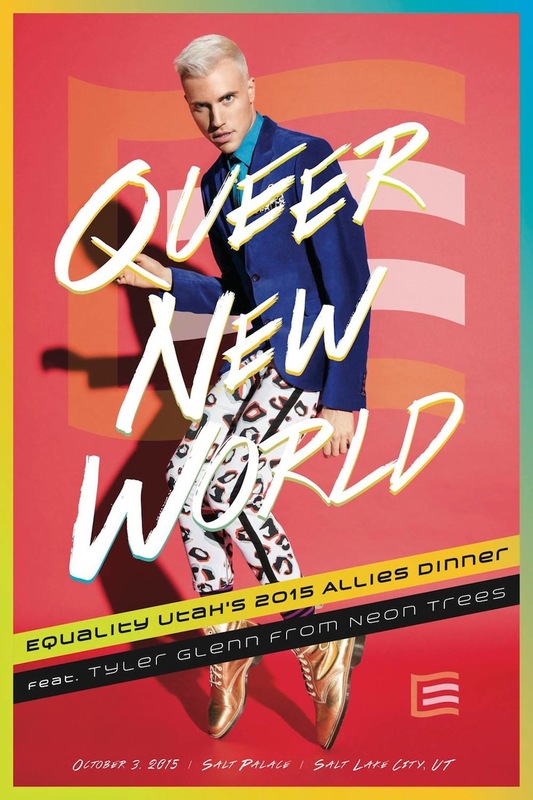 The dinner's theme is an apt (and fab) Queer New World, and Tyler Glenn of pop/rock group Neon Trees (Provo--represent!) will be present as keynote speaker and performer. Let's come together to honor the past, celebrate the present, and get all hyped about the good that the future will bring. Get your tickets, like, yesterday to this fabulous event and help support one of Utah's most fabulously deserving causes. Equality! Utah! What's not to love?